Here is a photo of Hannan's Rd Riverwood, CAMWEST's preferred design for on-road cycle lanes. (Hover over the green numbers to see an explanation). This design is a much improved solution and addresses a number of the issues raised in our report on cycling issues in the Parramatta LGA. There are two exciting events coming up: the very first Ride to Work in Parramatta's CBD, and CAMWEST's very popular Bay to Mountains ride. Don't miss out! Contact Ian on 9639 4654 or macian@pentire.com. Riverbank Centre on the banks of Parramatta River will supply free breakfasts for the first 60 participants with bikes. For more information, call Eva Martinez at Parramatta Council on 9635 5000. We have a new email address: contact (AT) camwest.pps.com.au. Please use this with your correspondence with us from now on. Many thanks to PPS for their continued support and hosting of our website. This year's Tizzana bike ride was a great success yet again, with many riders coming. Make sure you don't miss out next year! More info. 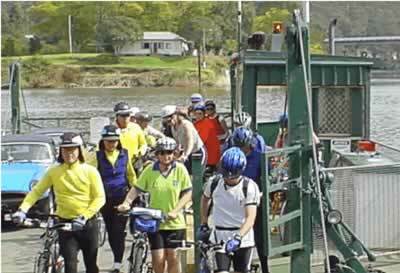 This is a social ride along quiet and picturesque roads with many views over the Hawkesbury River Valley, a few challenging hills, a couple of ferry crossings and short stretches of good gravel road to arrive at Tizzana Winery by 12:30 pm for a catered and very social lunch. The ride in May was again a great success with particular thanks going to Peter Gilbert and extended family for once again playing the major lead in this ride. However, it was a good team effort with a high number of CAMWEST members participating and assisting. Make sure you join us next year! Blacktown City Council has finalised a new Bike Plan prepared by consultants PKK. The purpose of the plan was to review existing cycleways & re-prioritise proposed cycelways over the next 10 years. The schedule of works is designed to link in with works planned by the RTA. All plans are for off road facilities. Hill cycleway from School of Arts building to Rooty Hill Railway Station. Route 7 Mt Druitt - maintenance work to existing cycleway from Lethbridge Park to Mt Druitt. Route 9 Rooty Hill / Mt Druitt - Cycle route along service road between Nurragingy Reserve & Rooty Hill railway station. The Bike Plan is still being analysised by CAMWEST and a submission will be made to Blacktown City Council. Blacktown cyclists would have noticed the increase of bike logos denoting cycleways painted on a number of popular routes. The Bell's Line of Road off road cycleway is proceeding towards Kurmond. Council Officers seem confident that the cycleway will reach Kurmond Primary School before crossing the road and continuing towards Kurrajong Village. The proposed bridge across Rickaby Creek from Howe Park to Deerubbin Park has been deferred while Council apply for a Government grant to make up the shortfall from the Section 94 funds of $60,000; the cost of the bridge has increased by approximately $40,000 because of technical problems. The other proposed bridge across Rickaby Creek from South Windsor/Bligh Park to Clarendon in the original Bike Plan and shelved because of cost is to be re-examined by the Committee. This connection would be of great benefit to many cyclists as it would allow easier access to the Showground, the Racecourse, Equestrian Centre, the UWS and Clarendon Cycleway. The Committee have allocated $10,000 to the Council Road Safety Oficer for promotion of safe cycling in the Hawkesbury which will include an education programme targeting all schools, new pocket size maps and the installation of one metre square maps of the cycleways at prime sites throughout the district;approximately 18 in total. Bicycle Cops are currently undergoing training and will commence work during Bicycle Week. We expect a vast improvement in the conduct of many locals especially the wearing of helmets. We have prepared a submission for the Merrylands Urban Redevelopment Program. We also had a member speak to a council meeting and there was apparently considerable interest in cycling matters from a number of councillors. A letter was sent to Holroyd Mayor requesting a meeting to discuss the idea of forming a bicycle steering committee. There was interest in the idea, and we will work on a submission to council especially regarding the model of steering committee. Upgrading the Crestwood Reserve section of the Parramatta to Rouse Hill Regional Cycleway. New cycleways are under construction in Fred Caterson Reserve and works are currently progressing with a bridge crossing to be installed soon linking the cycleway with Cedar Grove and King Road Kellyville. Several needed links are also completed or under construction. Leone Ave to Windsor Rd, Baulkham Hills, from the Toongabbie Creek Regional Cycleway at Seven Hills Rd through Michael Simpson and Sophie Doyle Reserves to Jasper Rd which then links through Tory Burn Reserve to Roxborough Park Rd Cycleway and Castle Hill. The link from Castle Hill at Castlewood Dr through to Highs Rd in the West Pennant Hills Valley is also ready for construction. Volunteers are continuing the construction, with Council paying for the materials, of the Glenhaven Cycleway along Old Northern Road, between Glenhaven Road and Round Corner Dural. As part of Section 94 developer contribution works, numerous cycleway links are being constructed in the Kellyville/Rouse Hill precincts. There are several issues that are still being reviewed, barriers across cycleways and walkways, poorly or inappropriately placed bollards, poorly designed or coloured bollards, and poor design of some parts of cycleways and placement of children's play areas adjacent to or across cycleways. We are also concerned about the level of communication between the different sections of Baulkham Hills Shire Council that deal with cycleways, particularly between the relevant sections of Council and the Cycleways Coordinator and the Baulkham Hills Shire Council Cycleways Management Committee. However, Baulkham Hills Shire Council should be congratulated for it's progressive attitude to cycleway development, the creation of a full-time Cycleways Coordinator position, and the official Council Cycleways Management Committee. Oil prices have increased dramatically recently, approaching the U$30 mark, due to fears of a US attack on Iraq and potential disruptions. This is a reminder that we need to minimise Australia's dependence on foreign oil. Instability in the Middle East could cause big swings in the oil price, which in turn could have a detrimental impact on our economy. The government needs to further fund and encourage cycling and public transport. If it can fund road projects such as the Western Orbital (which will only generate more traffic and make us more dependent on oil), it can also fund the Parramatta-Chatswood Link train line. As another example, the government could require State Governments to spend just 2.5% of the Roads to Recovery funding on cycling infrastructure and initiatives. There are a number of bike lockers available at Parramatta, Blacktown, and Seven Hills stations and Parramatta wharf. These lockers are a great deal from Bicycle NSW. Save money on the car or bus, while getting fit! Parramatta City Council has confirmed they will provide $500 towards our Bay to Mountains ride on 19th October. Thank you to Ian MacIndoe and Cr Chris Worthington for their help. Council's support is a great way to promote cycling in the Parramatta area, something councils are meant to do under the RTA's BikePlan 2010. Well done council! Road rage at its worst. Thousands of four-wheel drive owners across Australia may be forced to fit smaller bullbars to their vehicles as governments face increased pressure to enforce design laws because of safety fears. "Oil has sustained the alliance between the U.S. and Saudi Arabia for decades. But extremism in the kingdom is putting those ties to the test"
A survey of where we are up to in our treatment of our planet. We need more members to achieve better bike facilities in Western Sydney. There's a number of projects we'd like to get involved in. Join us and make a difference. We're especially looking for people in the Penrith area. 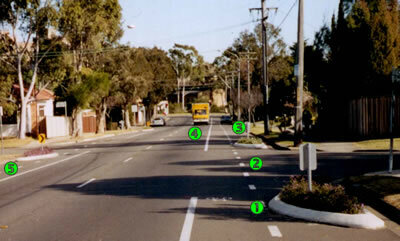 Write/Email to Parramatta Council and ask them to implement CAMWEST's preferred cycle lane design. Thank you for your recent efforts to improve cycling in Parramatta. Please adopt CAMWEST's preferred cycle lane design as the standard design for the Parramatta LGA. I feel it is a significantly better and safer solution.